Newly released this year, slot developer Play 'n' Go – the makers of such original titles like the sci-fi slot Space Race and the interesting take on the wildlife slot, Photo Safari – have launched a slot soaked in blood, packed with buxom beauties and wild times; just a regular Saturday night out then! 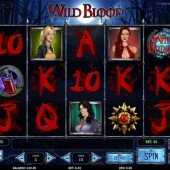 Wild Blood is a 5 reel, 15 pay-line slot that taps into a fascination with vampires and Gothic horror that never seems to die – much like the three fang-toothed beauties in this slot. As well as the three buxom maidens, there’s a handsome vampire, vials of blood, and some spooky-looking 10-through-Ace symbols. This has everything you could want if you were a fan of Twilight and True Blood. If you're not a fan of those then don't quite quit reading yet. Watch Out for the Vampire Wild! The moody music adds to the atmosphere, and considering as I write this we’re getting close to Halloween it’s the perfect slot to be playing right now. The Vampire guy acts as the game’s Wild, and he substitutes for all symbols other than the bonus and Scatter. When appearing on the center reel he expands to fill the whole reel, and I found him appearing quite regularly. With the Wild you will be able to win free spins. Not only that, if you hit a silver and gold amulet on either side of the bloke, you’ll get five re-spins straight away and the Expanding Wild is held during spins. Look out for the Vial of Blood symbol, as three across the reels anywhere triggers a free spins round. First you’ll get to choose from six vials of blood on the screen to find out how many spins, multipliers, or instant prizes you receive. Free spins receive a 2x multiplier, you can win up to 50 of the bloodsuckers, and they can also be re-triggered. When they are, prizes are multiplied by five. The other Scatter is the Wild Blood Logo symbol. Get two of them and you will win an instant coin prize, although as far as triggering any bonus rounds, that’s as far as it plays. With a low betting range (coins start at just $0.01) and only 15 pay-lines, you probably won’t be seeing too much return here, although as I said, the Expanding Wild hit frequently for me, and the free spins were diverting enough. 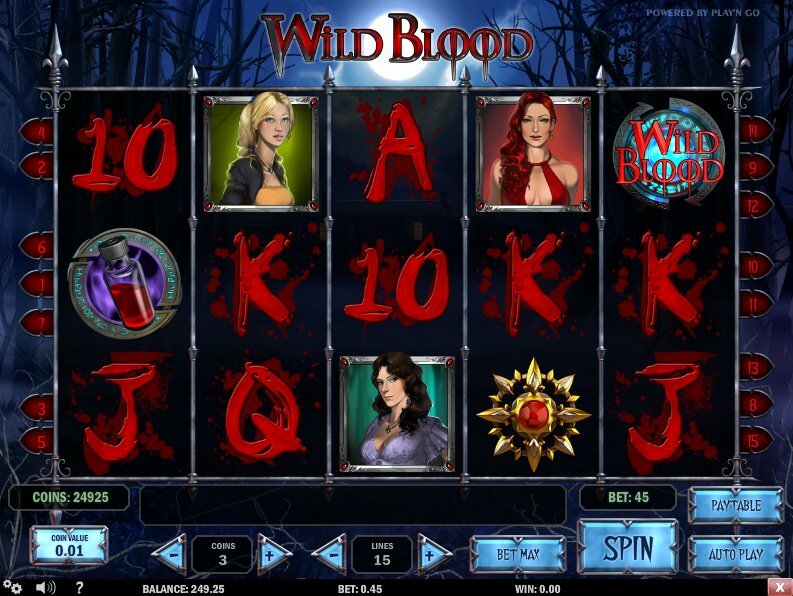 Horror-themed slots come and go online, and Wild Blood certainly holds its own against some of the better fright night slots on the market. Immortal Romance, the Gothic-themed slot from Microgaming, should be your first port of call, with its stunning graphics and 243-ways betting system, while Full Moon Fortunes is a great werewolf-inspired addition to the cabal of scary slots.